Client acquisition was long thought to be the golden child of business development. Only in recent years has the scale tipped, where more and more businesses are recognizing the value behind client retention and customer referrals. Yet in many businesses, budgets and efforts are still heavily skewed toward the acquisition side. Let’s not beat around the bush. We’re hereby debunking the myth that client acquisition is the best — and only — way to grow your contracting business. This whitepaper will tell you why we can say that confidently, what it means for your business, and how you can ramp up your own client retention and referral efforts. While there’s no right or wrong answer to the question of which is more beneficial (acquisition or retention), we’d say there’s pretty good reason for thinking out of the acquisition box. We’re surely not the first people to introduce this adage to you. Everyone’s after ways to work smarter, not harder, in order to increase revenues with minimal extra effort. Here’s one solid way: focus on retention. Consider this: it costs five times more to get a new customer than it does to earn repeat business or a referral out of an existing customer. That cost is spent on lead generation, marketing campaigns, advertising solutions, proposal creation and more — all activities that require significant time commitment and energy from your staff. While that’s going on, your current client base — the low-hanging fruit, if you will — is already in your wheelhouse, waiting to be connected with. Your staff’s time spent focused on their experience and their needs will provide exponential returns, as shown below. 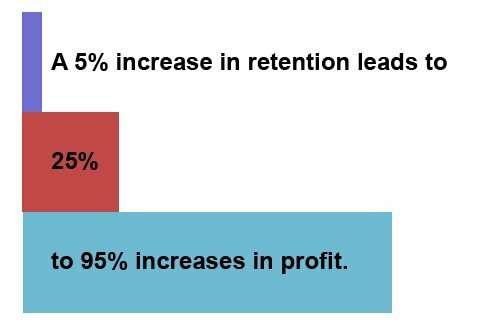 Retention can increase profits more quickly that acquisition efforts. Let’s explore: we’ll say that Henry is a contractor selling insulation services. For the sake of simple illustration, we’ll say each of the services costs $1000. At that rate, he’ll need to sell 1,000 retrofits this year to hit $200,000 in profits. However, if he were to sell additional retrofits at the same rate to existing clients or to customers who come off referrals from existing clients, he could eliminate the $200 acquisition cost to see a $400 profit margin. This would effectively slash the amount of sales needed to make his $200,000 profit goal in half, and he’ll see the added bonus of decreased general and administrative costs along the way. Remember: existing customers and referrals from happy customers take less time to quote and require less on the administrative side as they are already comfortable with you as their contractor. When the focus shifts from acquisition to retention and referrals, it doesn’t necessarily mean less time needed from staff — what it does mean is a reallocation of where that time is spent and in turn, a change in how profits are made. The greatest shift will be in the time — and therefore money — spent on sales and marketing, at least in the traditional sense. Once retention and referrals are the drivers, efforts must be placed on perfecting each touchpoint with the client, adding up to an ideal customer experience, and then developing the best marketing methods to keep them buying at that increased profit margin or referring new customers. This is perhaps our favorite happy side effect of focusing more effort on retention: client retention can organically grow acquisition. As you delight your customers with a more-than-satisfying customer experience and they become loyal to your business, it will naturally drive word-of-mouth referrals, online reviews, and other customer-generated marketing. Referrals come at no cost to your company, beyond taking care of the customers you already have. As the lowest cost of driving new business, why not put some simple things in place to take advantage of it? Retention for the win… or is it? Convinced yet? Generating repeat business through customer retention strategies seems like it should be a pretty cut-and-dry solution to the desire for a more lucrative path for businesses, yet it hasn’t earned its spot in the driver’s seat just yet. In fact, a recent study from Econsultancy shared that in 2014, 34 percent of marketers committed to spending more on client acquisition while only 18 percent said they’d focus on retention. Not surprisingly, less than half of the companies surveyed split their time and resources equally between acquisition and retention efforts. For the half not dividing time equally, the majority of their efforts were spent on acquisition. Maybe the real issue is that your business would like to make the shift, but you’re not sure how to get started in earning referrals and building retention. We’re here to help. Keep track of the important things. Modern technology and sales systems mean tracking data regarding clients is not only simple; it’s necessary to understanding your customers. While small- to mid-size businesses may not have the resources for involved analytics, simply capturing email addresses and tracking certain client notes gleaned from queries or consultations can allow you to better tailor future marketing and communications to those. A note here: you can come right out and ask your clients for comments and feedback that will add to your repository. Implement customer surveys and garner feedback often. Having client data at your fingertips is paramount for what we’ll touch on next. As mentioned, it’s imperative that each touchpoint in your marketing, sales, onboarding, and service processes encountered by the client is considered when you set out to increase retention. From the very first query form a potential customer fills out to the final payment, the client experience has to be something to write home about. Remember: no two relationships should be the same. Having data on your clients can lay the groundwork for personalizing the customer experience. This could mean individualized recommendations on what to purchase, relevant special offers for services in their interest, or premium add ons that make the experience unique to them. Establishing yourself or your team as the go-to in case of anything — not just the things that come up with a specific project — will inherently add loyalty in the relationship. Efficiency is imperative to this equation, as it allows you to better cater to your clients. For example, having all content optimized for mobile devices allows you to have materials at the ready from anywhere, at anytime. This aids your accessibility as an expert — when a current client engages with you, your response will be quick and informed. Gift cards or discounts for referring a friend or family member to your site or service. It takes time and money to execute, but your cost per lead will be more rewarding than any other advertising, so take advantage of what you’ve already built. Refer a friend; receive a discount on your next Double whammy: retain + refer. Raffle for a company gift card where customers get an entry for each person they refer to you or online review they submit. Need to get reviews going in the first place? Provide an incentive for your customers to head online and write up a review. The yellow pages are hardly the place to go anymore; reviews are your best friend when Google rules the search world. Gather customer emails. Build your list and use it for some type of ongoing communication. It’s one of the most affordable and most effective ways to keep in touch with your customers. Send either digital or physical holiday and birthday cards. Offer friendly reminders of projects they wanted to do but didn’t originally have the budget for. Announce new staff or interesting project progress that might intrigue them. It’s important to get creative when you’re in the business of cultivating and nurturing customer relationships. As you’ve seen, the payoff is worth the effort. If you’re a startup, it’s wise to stay focused on acquisition. Acquisition serves as the foundation for retention to be built off of. Until you have a steady client base that you can focus on retaining, work on earning a base of ideal, loyal clients. Next — and this goes for all businesses, everywhere — don’t eliminate acquisition entirely. Strike a healthy balance that capitalizes on the returns of retention, but doesn’t dry up the pipeline of new customers. Repeat customers, no matter their loyalty, will run the chance of having to drop off at some point for various reasons beyond your control. And finally, remember this: have patience. Yes, you can run a lead-gen or advertising campaign and see immediate results, but building trust and loyalty takes time. Once the foundation is there, you can capitalize on it for months, years, even decades to come as those clients continue buying from you. As time spent on sales and marketing decreases, it also means is that the time you’ve put in upfront to court the customer, generate a proposal, and set up a contract will go much further. If you can simplify that process and vastly improve the customer experience in the first place — with an app like JobFLEX — the proposal and onboarding process will pay off in spades. JobFLEX was created for you to better serve your clients. Find out more about how JobFLEX can support your retention efforts by taking a free trial. Fullerton, Andrew. “Focus on Customer Retention Over Acquisition.” The Next Web. N.p., 21 Aug. 2014. Web. Jao, Jerry. “Customer Retention Should Outweigh Customer Acquisition.”CMO. Adobe, 2 Aug. 2013. Web. Lawrence, Alex. “Five Customer Retention Tips for Entrepreneurs.” Forbes. Forbes Magazine, 01 Nov. 2012. Web. Ratcliff, Christopher. “Marketers More Focused on Acquisition than Retention.” Econsultancy. N.p., 20 Aug. 2014. Web.